The 2016 San Diego Comic Con is almost upon us and if you’re a geek or pop culture fanatic the next four days will be better than Christmas and New Year’s Eve rolled into one. SDCC has grown considerably over the years to the point where it pretty much takes over all of downtown San Diego turning the entire city into one huge convention. Most of the attention will be on Hall H but that doesn’t mean there isn’t a lot more to do off the beaten path. Whether you want a sneak peek at a new show or some insight into how the geek mind works there is something for everyone at the Comic-Con. While it is going to be next to impossible to see everything there is at this year’s con we’ve made a list of our top events that you don’t want to miss. • American Gods Panel: Though it won’t debut until this Fall get your first look at the live action adaptation of Neil Gaiman’s famous novel. Executive producer Bryan Fuller will be on hand along with cast members Ian McShane, Bruce Langley and more. Friday, July 22, 3:15-4:15 p.m., Room 6BCF. 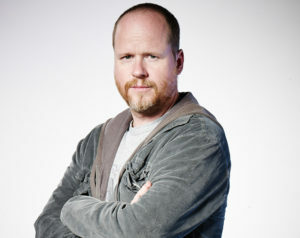 Joss Whedon will talk about his life and career at SDCC 2016. • Dark Horse Conversations with Joss Whedon: As one of the most visionary writers of the past 20 years Joss Whedon has rewarded fans the world over with some of the most compelling characters and plot lines in the history of comics, television, and movies. Here’s your chance to find out what he has in store next and get exclusive insight into Buffy the Vampire Slayer, Serenity, and much, much more! Friday, July 22, 3:45-4:45 p.m., Hall H.
• Women in Geek Culture: In 2010, nine women gathered onstage in front of a packed and engaged crowd at Comic-Con International to dispel the myth that “Geek Girls, like unicorns, don’t exist.” The subsequent six years have seen an explosion in female representation in geek spaces. Surveys tracking attendance numbers at fan-based events, as well as data regarding women gamers and comic book readers, are suggestive of gender parity within geek culture. Headlines coming out of Comic-Con itself proclaim that “women totally dominate” the event and that we are experiencing the rise of fangirls. But how far have women in geek culture really come since that landmark “Geek Girls Exist” panel? Andrea Letamendi (Pop Culture Hero Association), Jamie Broadax (Black Girl Nerds), Kristin Rielly (Geek Girls Network), Suzanne Scott (UT-Austin), Sam Maggs (Bioware, Fangirl’s Guide to the Galaxy), Marie Poole (Lone Shark Games), and moderator Jennifer K. Stuller (GeekGirlCon, Ink-Stained Amazon) talk about what interventions are being made in the culture, what areas still need work, and what the fangirl future holds. Saturday, July 23, 11 a.m.-12 p.m., Room 25ABC. • The Simpsons: The Simpsons is heading into its 600th episode. Creator Matt Groening, executive producers Al Jean and Matt Selman, supervising director Mike B. Anderson, Oscar-nominated director of The Simpsons Movie David Silverman, and voice of Bart Simpson Nancy Cartwright offer some juicy tidbits on the 28th season and beyond! July 23, 12-12:45 p.m, Ballroom 20. • Anything Goes with Jon Barrowman: John Barrowman (Arrow, Torchwood, Doctor Who) is an entertainer with a capital E: He sings; he dances; he acts; he presents; he judges. Ask him anything. July 24, 2-3 p.m, Room 6BCF.